A young orphan is raised as a ward at Candlekeep, the greatest repository of lore and knowledge in all of Faerun. One night their foster-father Gorion attempts to smuggle them out of the castle, warning of a threat to their life. Gorion is brutally murdered by a mysterious armoured figure, leaving his ward only with vague directions to the Friendly Arm Inn...and a destiny they cannot conceive of. In 1998 the western RPG genre looked like it might be in trouble. The bright and colourful Final Fantasy VII, complete with memorable characters and a complex, involving narrative backed up by incredible cut scenes, had redefined what roleplaying games could look and play like. Against that style of gameplay, the traditional fantasy CRPG series (like Ultima and Might and Magic) couldn't help but look dated. Enter BioWare. A brand-new company hailing from Canada, with a solitary action game under their belts, they joined forces with Black Isle, the creators of Fallout. Using their custom-designed Infinity Engine and the Dungeons and Dragons and Forgotten Realms licences, they created arguably the most genre-defining game of its time, the game whose DNA would trickle down for two decades and can still be seen in their most recent games like Dragon Age: Inquisition and Mass Effect: Andromeda. 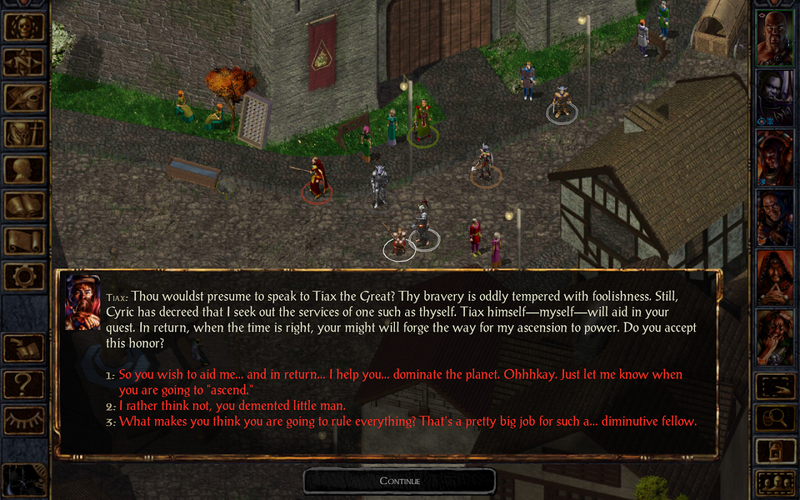 Baldur's Gate is a game that likes to have its cake and eats it. The player has to create a character from scratch, giving them the flexibility and freedom that is a hallmark of western RPGs, but the companion characters are all carefully-crafted people with their own wants, desires, motivations and backstories. The game has a complex, winding central narrative but also lots of optional side-quests, humour and grit. The game is reasonably linear in how the story unfolds, but there's also quite a few optional wilderness areas and dungeons to explore, giving the illusion of an open world. The game takes place in real-time but you can pause at any time, set AI responses to situation and make combat as automated or as micro-managed an affair as you like. All of this works remarkably well. For its time Baldur's Gate had a solid, intuitive interface and it remains so now, especially with either the Enhanced Edition or mods, which retrofit many of the later control and command improvements from the sequels onto this game. Selecting characters, modifying inventories and engaging in combat is all pretty easy. There is some head-scratching from the occasionally counter-intuitive 2nd Edition D&D rules but once you get the hang of that (roll high to hit, but make sure your armour score is as low as possible) the game is pretty straightforward. In the unmodded, original version of the game inventory management can be a bit of a nightmare but the Enhanced Edition and mods both add chests and containers that make carrying loot, potions and magical scrolls a lot easier. Baldur's Gate is a very respectfully sized game, clocking in around 40 hours at length for a reasonably thorough playthrough (and a fair bit more for a very exhaustive, no-stone-left-unturned approach), and the story twists and turns through several intriguing set pieces and revelations. Given engine limitations, the game doesn't get bogged down in lengthy exposition or CGI cut scenes that tell the story at the expense of involving gameplay. Graphically, the game can't help but feel a little dated, but it gets the job done reasonably well and the hand-drawn backgrounds and sprites have a lot of charm to them. The musical score is restrained but evocative and the sound design, especially the background to the streets and wilderness, is actually still highly impressive. There isn't much to criticise Baldur's Gate about. It remains, astonishingly for a game released so long ago, incredibly playable, fiendishly engaging and engrossing in its writing and characters. One criticism is that the game perhaps has too many scrolls, spells and potions that are of limited utility and end up just taking up space. There's also the game's overwhelming need for everyone to carry missile weapons but, even in the later revamps of the game, still not providing enough quivers or ammo bags, meaning you spend a not-insubstantial amounts of time fiddling around in your backpack with stacks of arrows. Also, those who like to have their games throw tons of exposition at them and feature lots of tool tips explaining in exacting detail what they need to do next may feel a little lost. Baldur's Gate gives you a world to explore, not GPS coordinates to tick off, and sometimes that means wandering into areas too tough to handle at a low level. Baldur's Gate isn't a really hard game (especially compared to some of its contemporaries), but compared to modern RPGs it really doesn't forgive foolish decisions or impatience. 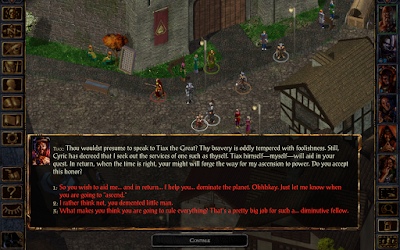 Baldur's Gate (****½) remains an engrossing, compelling CRPG experience and has aged like a fine wine. It is also very much just the prologue to a much larger storyline which continues in the even better Baldur's Gate II: Shadows of Amn. There is also an optional expansion, Siege of Dragonspear, which links the two games. Your Baldur's Gate character can be taken into Siege of Dragonspear and from there into Baldur's Gate II for a single roleplaying epic lasting well over 200 hours. Note on Versions: Baldur's Gate is available in two flavours. The original version of the game, adjusted to be compatible with modern versions of Windows, can be found in boxed copies and on online stores. Although still playable, lacks many of the improvements from the later Infinity Engine games. It can, however, be modded for widescreen support, better graphical effects, an improved interface and so on. 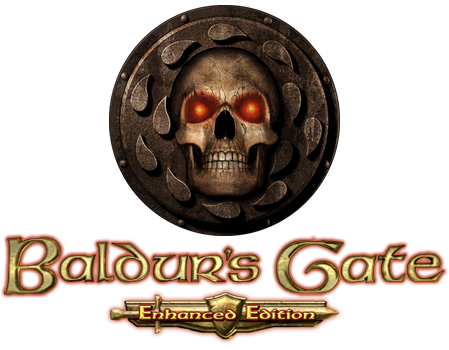 Baldur's Gate: Enhanced Edition, from Beamdog, is a more comprehensive remaster of the game, adding a built-in widescreen mode, a zoom function and a much more responsive and intuitive interface. This edition also adds new characters (most of whom are risible but can be completely ignored) and an optional dungeon challenge mode, which is surprisingly fun. However, this version of the game replaces the original 3D CGI cut scenes with a 2D "comic panel"-style approach which really doesn't work very well. There's so little CG in the game it doesn't really matter, but does feel a little annoying. Both versions include the original expansion for Baldur's Gate, Tales of the Sword Coast, which adds a massive new dungeon in the shape of Durlag's Tower and a new village to explore. If you're a veteran Infinity Engine gamer who has no fear of mods, the original game may be a better bet, but for newcomers who just want to experience one of the most storied CRPGS of all time, the Enhanced Edition is a worthy alternative. You can find it now on Steam and GoG.